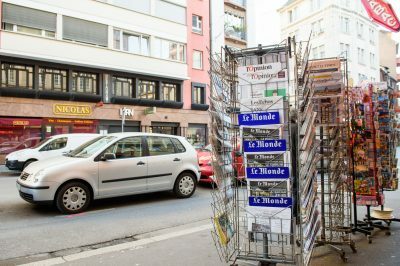 We all know that Francophone culture is an important part of language French, but we often don’t spend as much time as we should teaching our students about the cultures of the French-speaking peoples. 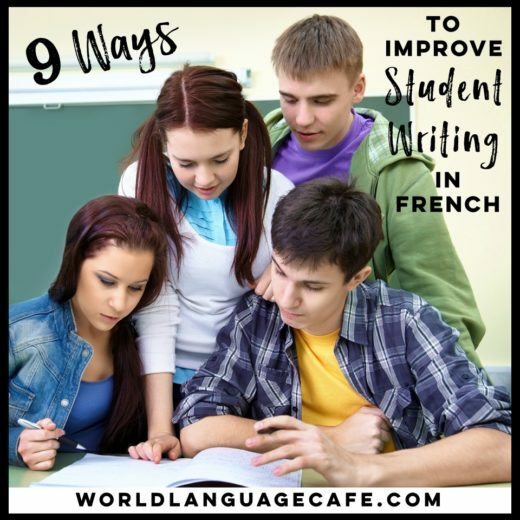 Let’s be honest, most of the time, the French culture that accompanies our textbooks is pretty weak, and we’re so busy creating lesson plans for the basics of language learning, that we run out of time for culture. 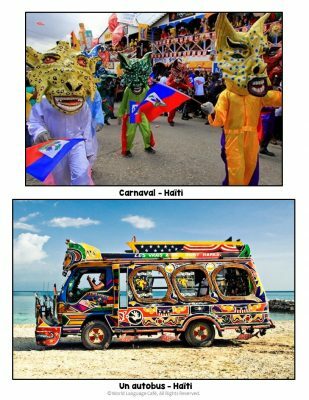 Today I’ll be sharing 15 cultural activities that you can use in class, plus free resources (Nationality Partners, France and Canada video clips, photos, and facts). If you want them right away, sign up below and you’ll get an email with the access information for my Free Resource Library – where are these freebies are waiting for you. Your students can’t name 10 French speaking countries (my favorite answers are: Germany, Japan, Spain, the U.S., and Europe). Your students are tired of learning grammar and verbs. Most of your students haven’t had the opportunity to travel outside your town or state. Commit to spending 15-30 minutes every week on culture. 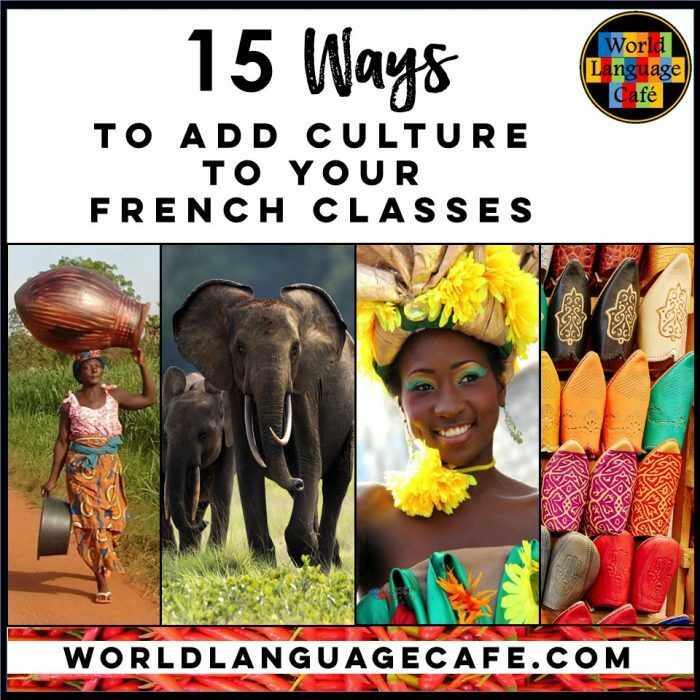 Here are 15 ways to incorporate culture into your French classes this year. 1. 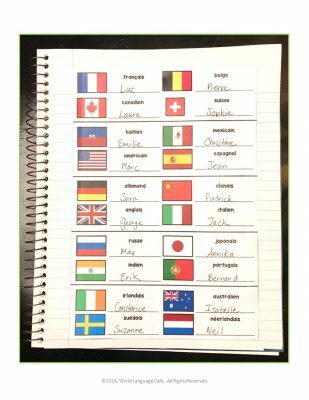 Use free Francophone nationality partners sheet to ensure that students work with a variety of partners throughout the year. Bonus: This will help them learn all the French-speaking countries. 2. 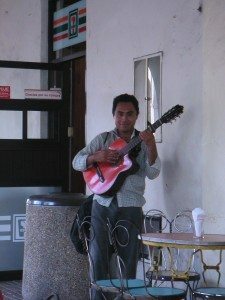 Post interesting facts and colorful photos from a different Francophone country every few weeks. 4. 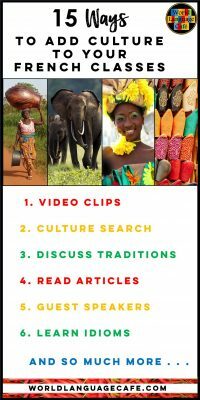 Show short video clips from all the Francophone countries to showcase culture. Absolutely love this one! In English. and various sites around the country. Les pousse-pousses (walking taxis), 8 min. In French. Talks about a different type of transportation in the second largest city in Madagascar. 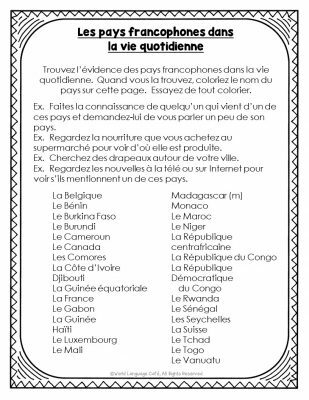 Give them this sheet listing the Francophone countries. Whenever they find something or someone from a Francophone country, they color the country and write what they found. 6. Discuss interesting traditions from other countries. Do your students know about 2 week Lucerne Carnival in Switzerland? Do they know about the tradition of finding the hidden object in the Galette des rois to become king or queen for the day? 7. Track down a Francophone student in your school and have him/her come talk to your classes. 8. Every Monday, have students share an article about a French-speaking country. 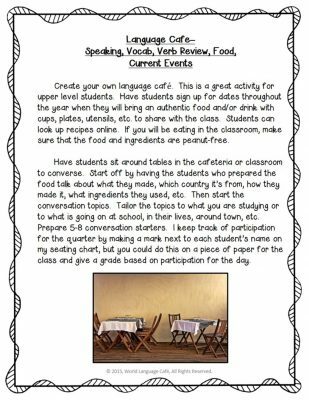 Lower level students can bring in articles in English and upper level students can bring in articles in French. 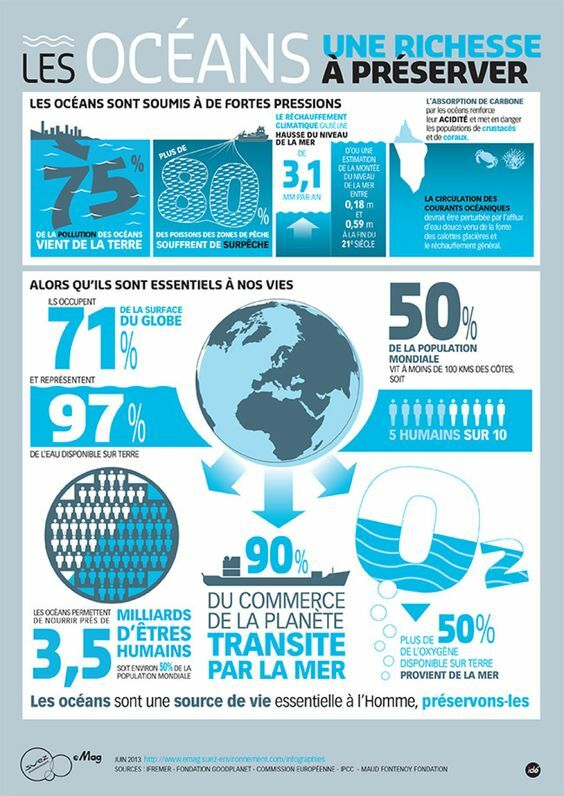 They should be prepared to give a quick summary in French of their articles. Check out my French Realia Pinterest board to get you started. Add different realia every few weeks to keep things fresh or pick one for each theme that you teach: health, environment, technology, careers, etc. Track down people from Francophone countries in your community and invite them to class to share their culture. Encourage them to bring photos, food, and other props. The speakers may only be able to present to 1-2 classes, so you may wish to invite multiple speakers to cover all your classes. 11. Read online or make a few class Pinterest boards about famous Francophones or Francophone countries. 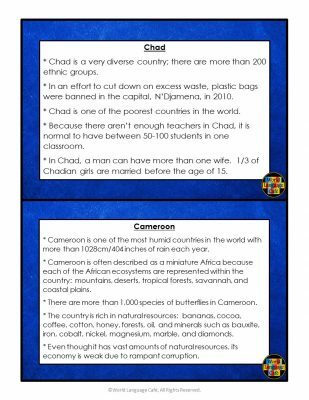 Divide each class into groups to see which group can create the best board for their topic. P.S. 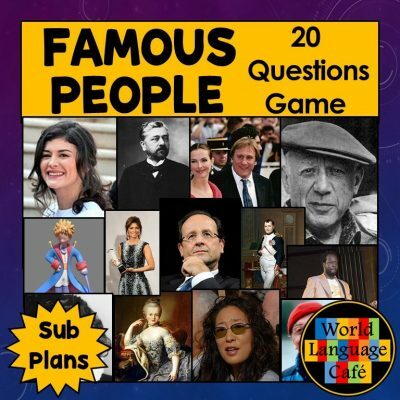 You might also like this famous people guessing game that includes many Francophones. Aicha by Khaled is one of my favorites (theme = women’s rights). 13. Show ads or YouTube clips. It’s really interesting to watch ads from other countries – great for comparing and contrasting culture. Cyprien has a really fun spoof on real life vs. what you see in ads. Some bad words (but is it really horrible if our students learn a few swears in French)? Just be sure to put the subtitles in French, not in English (use the settings tab to do this). LindsayDoesLanguages has a great list of 10 French YouTubers to watch. I also love Kemar and Natoo. Check out their fun adventure around Canada. 14. Share idioms, quotes, funny memes and jokes weekly with your students. 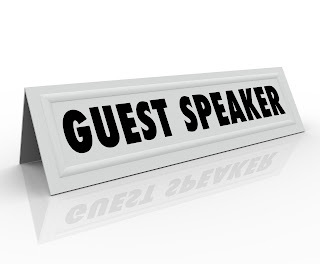 If you have a student who loves art, have her do a presentation about a famous museum or Francophone artist. 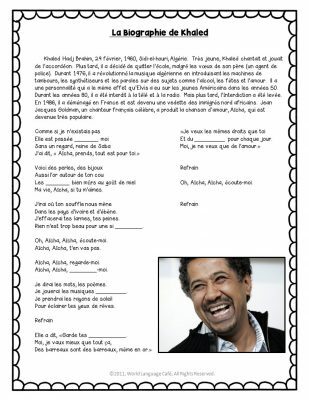 If you have a student who likes sing, have her perform a song from a French-speaking country. 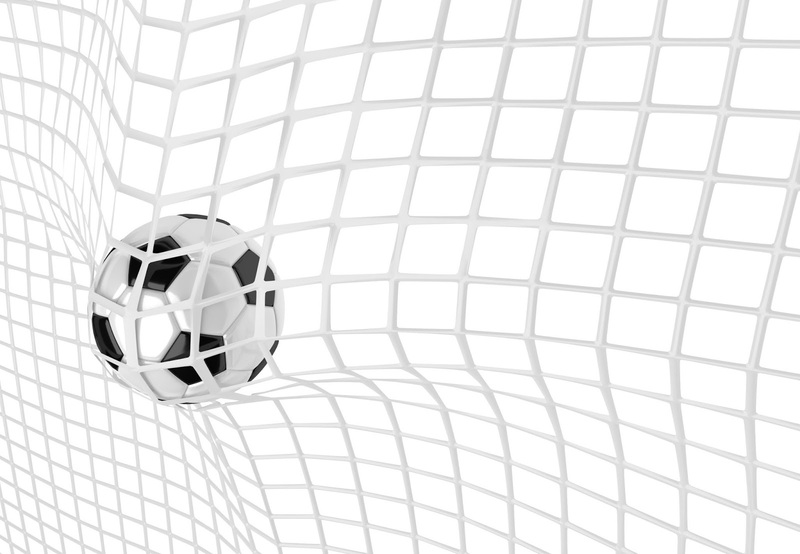 If you have a student who likes soccer, have him talk about a soccer team or player from a Francophone country. 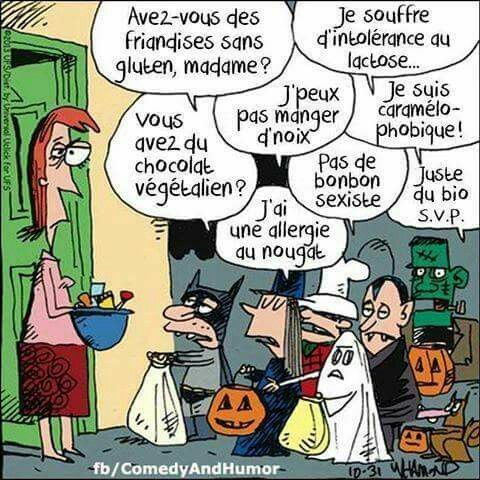 I hope that you found a few new ways to incorporate culture in your French class. I’d love to hear how you teach culture in your class. Please share your ideas in the comments section. 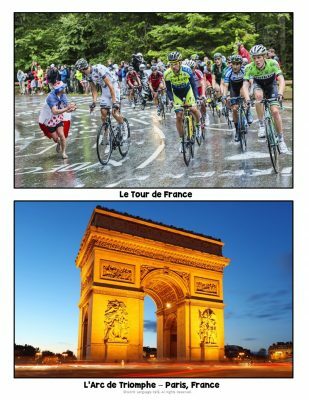 Remember to get your free cultural resources for France and Canada (photos, facts, video clips, etc.) 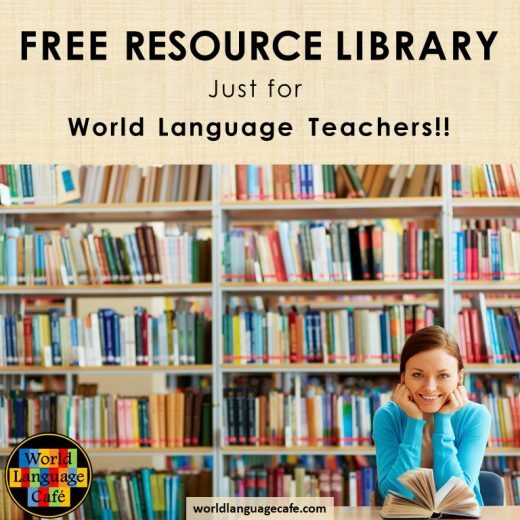 in my Free Resource Library – lots of goodies just waiting for you. Sign up below.